On November 2, at the first ever GovComm, InfoComm announced the launch of the STEP Foundation website. Project Green AV sat down with Allen Weidman, InfoComm International Sustainability Officer and Executive Director of the STEP Foundation, to offer the industry more clarity about what this program is and what it means for our AV industry. Allen shared his insights on STEP, its evolution and plans for the future as an environmentally responsible rating system for the AV industry. STEP, once an InfoComm initiative, has grown into the STEP Foundation. The Foundation is a collaboration among InfoComm, BICSI, CompTIA, and TIA. Together, the four trade associations "work in unison to focus on value for all members" in service to environmental responsibility and opportunities. The STEP Foundation is comprised of two representatives from each member association, with Scott Walker and Ray Kemp representing InfoComm. Energy management figures into STEP prominently. Thirty percent of STEP is dedicated to Smart Building Technologies (SBT). SBT is intrinsic to Green AV because it “humanizes the building” beyond materials used. Following its international success, Arrive Corp is entering the US market with a series of products that bring high functionality and environmental responsibility to the AV space. Rakesh Ranchod, Product Manager, brought the company to InfoComm Vegas this year. He offered a sneak preview of products due out by year end that were "extremely well received." Arrive's new products are part of its NX.GEN.AV, a combined hardware-software-service model that consolidates on-premise applications and flexible online services for scheduling, collaboration, resource management, and signal management. NX.GEN.AV products are designed with space reduction, energy reduction, and cradle to grave lifecycle responsibility in mind. Arrive's RoomPointTM, a NX.GEN.AV product, is an "Intelligent Media Processor" for use in classrooms, conference rooms, boardrooms and theaters where users need high functionality and seek cost savings and environmentally responsible solutions to energy consumption. 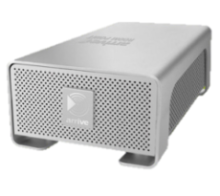 RoomPointTM is made of 100% recycled unicast aluminum and "shrinks the AV rack" into an eye appealing, small form factor unit that connects over the existing IT infrastructure to manage AV in education, corporate and other environments. Its power management capabilities deliver zero-watt draw upon shutdown, enabling organizations to reduce AV equipment energy consumption. Its compact, fan-less design lends itself to natural aeration and heat dissipation. In addition to Green AV functionality, RoomPointTM boasts a versatile blade-based design that allows customers to upgrade and scale cost-effectively as switching requirements evolve. Project Green AV’s Product Green feature highlights products we find that put Green AV ideas into action. Equipment that fulfills multiple functions not only saves space but is generally more cost effective. Specifically for AV, reducing the number of devices in a typical rack offers a variety of benefits that translate into financial, material and energy savings as well as responsible procurement. This is especially true for the new Enova DVX-3150 from AMX. 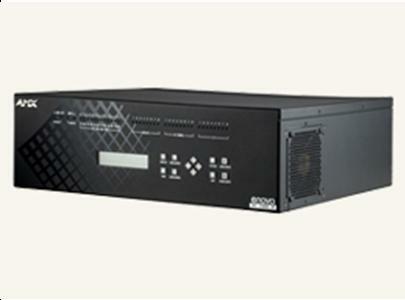 The Enova DVX-3150 is an all-in-one switcher which replaces up to 10 different rack components. There is an obvious financial benefit to removing that many devices from a typical rack. However, beyond the financial benefit is the energy savings (think: even MORE financial benefits). When active, the DVX consumes about 80% less energy than a standard rack configuration- that’s a mere 90 watts. With the amplifier, expect it to draw 95- 110 watts. In standby, the DVX crushes both a competitive product and a standard rack by using only 10% of the energy- 30 watts. The Enova DVX-3150 is a single device about the size of a desktop tower; the reduction in the amount of heat that it gives off, and therefore the amount of additional outside cooling required, can also be calculated into the energy savings. The DVX is a great option to help further your client’s green initiatives and offer a visible reduction in the electric bill. Green devices should take into account more than energy savings. Design, procurement, materials, assembly, social responsibility and shipping are all part of the overall environmental impact of a product. AMX understands this and has designed a device that moves beyond efficiency. By replacing up to 10 components, the DVX reduces the amount of materials required to manufacture all those devices (being shipped from manufacturers around the world). It eliminates 9 devices worth of packaging and overall shipping carbon footprint, especially for our readers in North America; the DVX is designed in the US and manufactured in Mexico at a plant which has established environmentally responsible manufacturing practices. One of our favorite benefits of the DVX is that it is built to be “future-proof.” Perhaps no product can definitively claim that it is completely ready to adapt to the technology of the future but the DVX does have 3D video and surround sound capabilities and can be configured for a change in environment. The DVX offers the potential of a longer useful life-cycle and a lower cost of ownership. With the Enova DVX-3150, AMX has developed a product that is energy efficient, environmentally responsible and scalable without compromising performance. At Project Green AV we are looking forward to covering a Green installation using this remarkable product. Read more Product Green Features from Project Green AV. Submit a Press Release about your latest AV and IT products and services. Visit the Press Desk @ PGAV. Every once in a while an opportunity appears in the AV industry which didn’t exist a year ago – and we look around and say “that product now meets this new need.” This is exactly the case with regards to the LynTec RPC Series Circuit Breaker Panels. Their controllable, networkable motorized circuit breaker panel meets many of the electrical power monitoring & control required for an energy efficient installation. The LynTec RPC circuit breaker panels include web enabled control and monitoring making remote access easy. Take for example any medium – large scale AV system where multiple AC circuits are required. Now it’s simple - specify (or tell the M/E/P Consultant you need) a LynTec RPC panel and you want all AV circuits to originate at this dedicated panel. This makes managing all AV power circuits simple. It also provides a dedicated circuit breaker panel, located within the AV control room (so the breakers are readily accessible) which can be isolated from other building circuits to avoid noise and interference from motors, compressors etc.